Hallelujah! Brick House Pizza Company has finally opened in Streetsville. We’ve been waiting eagerly since they posted the sign “Saucy presents Brick House Pizza. Get ready Streetsville.” Saucy’s flavour-packed food had us at hello, since the moment the restaurant opened in November 2000. They are delivering big flavours again with artisanal, wood-fired, take-out pizza from Brick House Pizza Company. You can smell the wood burning in the brick oven from the parking lot. They don’t offer delivery yet, but olive that it is so easy to park right in front and pick up yourself. The wood-fired crust on the Mama Roni that my son ordered was brushed with an herb-flecked tomato sauce made from puréed San Marzanno tomatoes (grown in the volcanic soil of Mount Vesuvio in Napoli, Italy – the birthplace of pizza), then covered with plenty of Mozzarella cheese and scattered with lots of crispy, spicy, dry cured pepperoni. It was pepperoni pizza done the way it should be. I have been pining for a good pizza Margherita ever since I enviously watched Julia Roberts fall head over heals into a steamy affair with the Margherita pizza she ate in Napoli, Italy, in the movie Eat, Pray, Love. Brick House Pizza’s version satisfied my urge with a thin and chewy crust spread with olive oil and chunks of stewed San Marzanno tomatoes. It was perfumed with strips of fresh basil, topped with gooey Mozzarella cheese and dotted with melted globs of Bocconcini cheese (fresh mozzarella balls). Olived my husband’s own creation the best. Our teeth crunched salty prosciutto then sunk down through oozing mozzarella into sweet tomato sauce and chewy crust. The highlight was the tang of the creamy blue cheese as it hit our tongues (just the right amount of dabs here and there without overpowering you). My husband asked “How can I ever go back to chain store pizza when I can have this?” And thus begins our love affair with Brick House Pizza. Not only is the pizza delicious but olive that they offer good, freshly made salad. The Caesar salad was full of crisp romaine leaves dressed in creamy vinaigrette with a kick of garlic and sprinkled with airy croutons, bits of shaved parmesan and chunks of real bacon that is cooked in the wood burning oven. One Caesar salad could feed 2-3 people if you are eating it with pizza. I don’t know how I will find the strength to pull myself away from the pizza to try the rest of the menu but the sandwiches sound mouthwatering. Check out the link to their site below to see all of the alluring items offered on the menu. If you don’t know about Bistro Narra, you should. It is a gem of a restaurant in the Churchill Meadows community of Mississauga. Olive it because the chef’s classic European training shines through in the consistently delicious food. 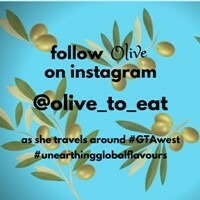 Olive it because I can enjoy this lovely dining experience at very reasonable prices. Owned and operated by Austrian-trained chef Franz Hochholdinger and his wife, Esther, it opened in December 2010 as a sister restaurant to the Apricot Tree Café. I have been lucky enough to dine at Bistro Narra on several occasions recently. 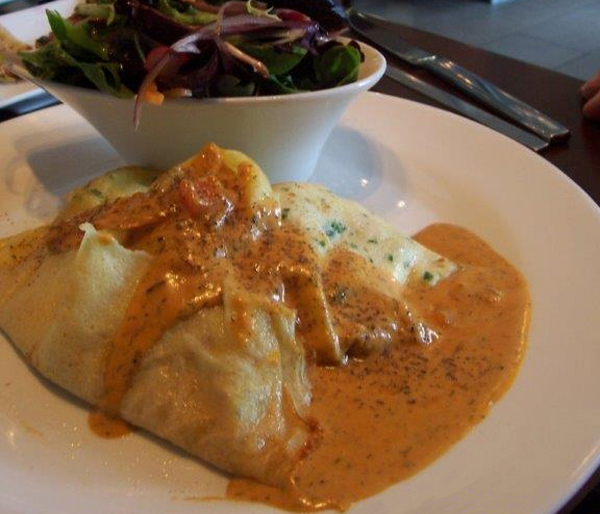 The Chicken Crêpe (available at both restaurants) has long been a favourite of mine. 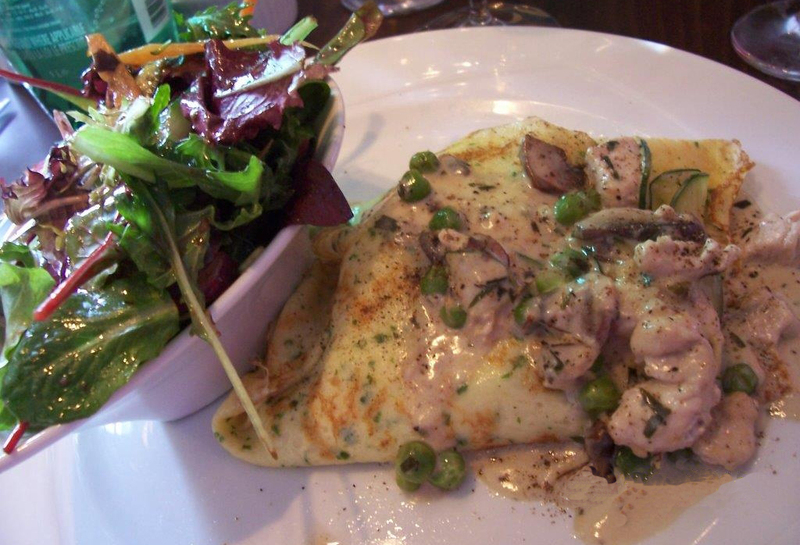 Plump morsels of juicy chicken breasts, mushrooms, tender zucchini, and sweet peas in an exquisite cream sauce (subtly laced with tarragon) are wrapped up in a dainty crêpe and served with a mixed greens salad. Perfectly portioned and pleasingly priced at $11.00 at brunch. My father said that his Norwegian Crêpe was excellent. Smoked Norwegian salmon, bocconcini cheese, purple onion and roasted peppers are wrapped in a crêpe and blanketed with a rosé dill sauce. $12 at brunch. 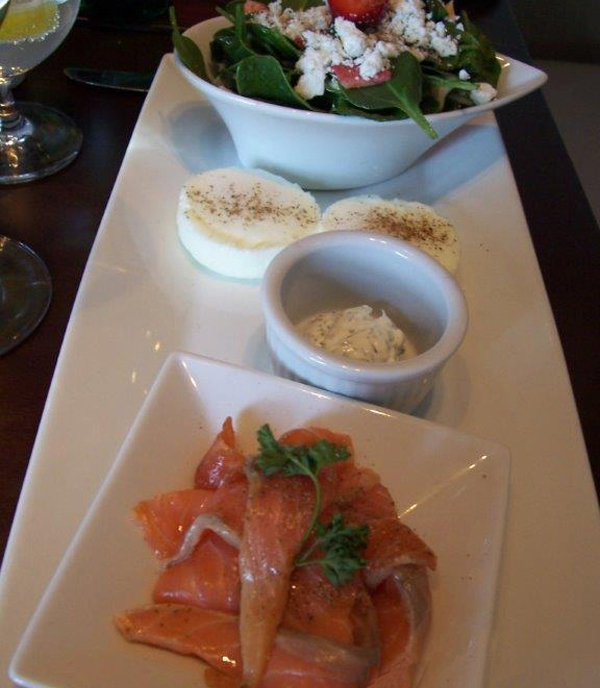 Our friend enjoyed the Narra Breakfast which was an elegantly plated healthy breakfast of delicious Gravad Lax (dill-cured salmon), poached eggs, citrus dressed spinach salad with strawberries, feta and almonds and toast at $8.50. On another occasion, when I dug my fork into the two poached eggs that were perched atop peameal bacon and English muffin halves, their sunny yokes spilled out happily over my plate and ran into the homemade Béarnaise sauce in a delicious embrace. The al dente asparagus and house frites were the perfect vehicle to deliver the yummy sauce to my lips. At $8.50 I would have to say the Narra Benedict is the one of the most delightful versions of Eggs Benedict in my little corner of the world. Oh, and there was fresh fruit on the plate. My son swooned when he ate his plate of flat iron steak cooked to perfection, bright green asparagus, homemade Hollandaise sauce and house frites all for the incredible price of $12 (sadly, it’s no longer on the menu). I love to see my son swoon. Even the regular coffee comes to the table with a bit of a creamy head on it – a small detail that is enough to keep a coffee lovin’ gal coming back for more. A couple of my friends decided Bistro Narra was the perfect spot to commit to a monthly girlfriends’ brunch date. Bravo Chefs Franz and Esther Hochholdinger! Bistro Narra is the sister restaurant of the Apricot Tree (opened in 1993). The Apricot Tree is a casual café that serves European pastries, as well as delicious breakfast, lunch and dinner. Most people who have dined at the Apricot Tree quickly become loyal customers, including me! 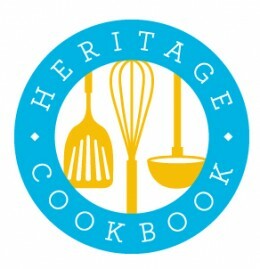 Check their website for details on giveaways and special offers throughout the year, in celebration of its 20th anniversary.